Chicken and broccoli is a simple as it gets. Served over steamed jasmine rice, this was a common weekend lunch growing up. Mom would heat some oil with ginger and garlic in her wok, then add thinly sliced chicken. Once the chicken was cooked she would remove it from the pan, and add the broccoli florets. A splash of water would deglaze the pan and steam the broccoli. Then Mom would return the chicken to the pan and add a thin slurry of corn starch to thicken the sauce. I had a busy morning of running errands, by the time I got home, my stomach was grumbling badly. This was a satisfying meal that came together quickly. On the Atkins phase 1, there is no rice or corn starch. So instead of having dry chicken and broccoli, I added kim chee (korean pickled cabbage) and a little tamari (wheat free soy sauce) to make it more saucy. The kim chee lended a briny spicy flavor, and the tamari gave it a rich earthiness. Add oil, garlic, and ginger to a cold wok or saute pan. Heat the pan over high heat until the garlic and ginger starts to sizzle. Season the chicken with a little salt, and add to the pan. Cook the chicken quickly, keeping the pieces moving a wooden spoon or chopsticks so they cook evenly. 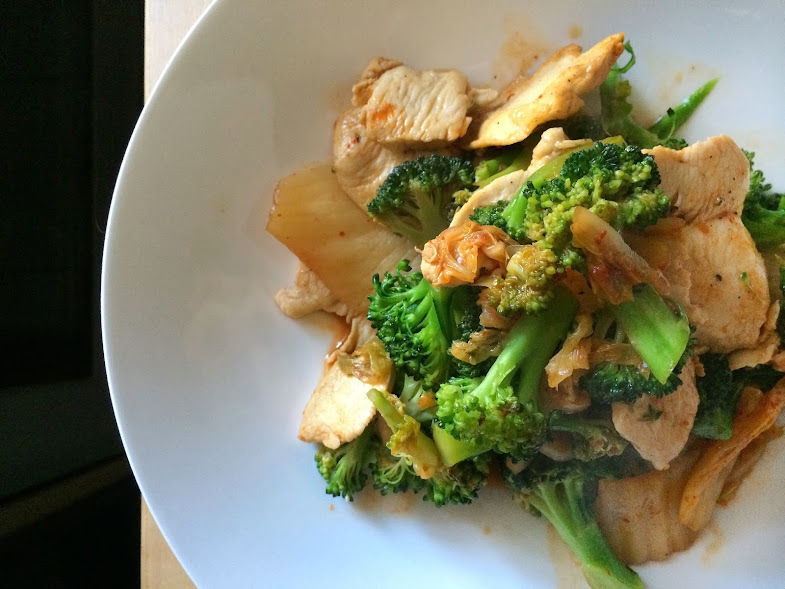 When the chicken is almost cooked through, add the broccoli and kim chee. Be careful as the liquid in the kim chee will cause the hot oil in the pan to spatter. Steam until the broccoli turns bright green and is cooked through. Add a little water to the pan if necessary to steam the vegetables. Stir in tamari to taste and eat. 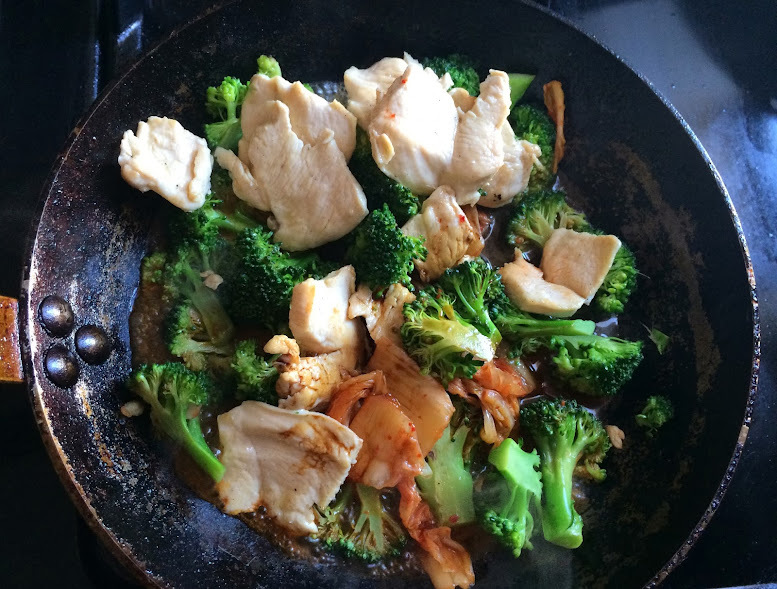 Tags: Atkins, Broccoli, Chicken, Chinese, Comfort Food, Cooking, Food, Garlic, Ginger, Kim Chee, Low Carb, Quick, Soy, Stir Fry, Tamari, Technique. Bookmark the permalink.